Unlike most products, beer companies have little direct contact with their consumers, making it difficult to collect first-hand insights about consumer behaviors and needs. In this episode of Mastering Innovation on SiriusXM Channel 132, Business Radio Powered by The Wharton School, Jenna Behrer, Senior Director and Head of Innovation at Heineken USA, discusses the tactics used to reach consumers, the regulatory challenges in America, and the introduction of new products like an in-home tap system. With a four-percent market share in the United States, Heineken is certainly not the largest beer company, but it sees ample opportunity for growth. After joining the company in 2016, Behrer helped introduce a wider variety of products into the U.S. market, using purchasing data to guide consumers to make a preference-based purchase. She describes the challenges of translating strategies from Europe to the U.S. and how Amazon is poised to change beer markets in America. Nicolaj Siggelkow: Director of innovation at a beer company — this sounds like a dream job to many of our listeners! It probably is a dream job, but first, please tell us what you actually do. Jenna Behrer: Well, we just sit around and drink beer all day! Siggelkow: That’s what I thought, and innovate around that. Behrer: What do we do here at Heineken USA? It’s all about how we can innovate in new spaces for Heineken and for beer in general. A bit of context for those who don’t know the beer market well: in the U.S., Heineken has about 4% share of the market here. When we think about innovation we really think about incremental white spaces and new occasions that we can bring our great products into. We spend a lot of time thinking about new occasions for beer and new trends that are coming up, but overall, my department is responsible for all new product, packaging, and business models that we launch to ultimately sell more beer to more consumers. Siggelkow: The way you just described it, you said, “We have 4% market share and we want to grow” — there are obviously two different ways. One way is, “Let’s try to steal some market share from someone else.” The second is just try to grow the pie; even if we keep our market share we’re growing our sales. Which of those two approaches is closer to your heart? Behrer: We are very interested in how we grow the pie. For those who know the go-to-market system in the U.S., it’s a complicated three-tier system which has distributors in between retailers and brewers. What that means is that we don’t have our own sales force that’s able to go and stock the shelves. It becomes critically important that we come out with innovations that truly drive the category. We’re seeing a lot of growth in the marketplace with wine and spirits; there’s an understanding of what is working well there and how we can make beer relevant in some of those occasions. Siggelkow: Obviously, this will rely on understanding the customer. Almost every guest we have on this show is all about customer understanding and learning more about the customer. Can you tell us a bit about the efforts underway at Heineken to understand this? Particularly as you were saying, because it can be a bit harder for you to have direct contact to your customers, more difficult than in other industries. Behrer: I’d say for us it operates on three different levels. The first is all about trends: what are the things that we see happening in the marketplace beyond beer? We have a consumer insights team that has a great model, which is all about seeing the trends that are coming towards us. How do we respond to things like people being more concerned about the environment, or people looking for personalization in their consumption? Obviously, digital has allowed us to do that in a more data-driven way, so now we have tools that can show us what people are talking about, getting real-time updates of how trends are navigating over time. The second level is all about diving into specific white spaces that we want to look at for the future. If there’s a new occasion that we think is interesting, how do we get out and talk to consumers about that occasion? We do a lot of ethnographies, a lot of consumer groups, and try to get to the consumers where we think it’s interesting. One anecdote: we have a super cool machine called the sub in the marketplace, which is a draft beer machine at home. Think of an espresso of beer. One of our hypotheses was that we thought it might be interesting for salons for customers to enjoy a beer while they were getting their hair cut. Instead of hiring an expensive insights agency, my team just got their hair cut a lot and went and spoke to people — which was a great way to validate that it wasn’t such a big opportunity if we all looked very sharp and had very short hair. The third level is, in the world of e-commerce, being able to really understand trends and data, especially with consumers who are purchasing our products: why they’re purchasing, how they’re repurchasing, and what types of people they are. We do as much as we can to get some of that first-party data to help us understand how we innovate in the future. Siggelkow: You mentioned that you’re looking at this trend towards personalization. Everyone wants to have a curated offering, and everything needs to be personalized to the individual customer. At the same time, you are, at some level, a mass manufacturer. It’s hard for you to customize the content of each beer can that you’re selling. What can you do along the personalization route? Behrer: Personalization takes a lot of forms. The way that people like to demonstrate their own personal interests and their own personal taste is by exploration of variety. What Heineken has going for us is that we have the Heineken brand, but we also operate in 192 countries with over 200 brands. What we’ve been able to do with a lot of our innovation (the sub being a good example of it) is if you check out draftforhome.com, you can order draft beer, but you can also get beers from all over the world. That might mean for you that if you are more of a lager drinker, you stock your basket with a Dos Equis lager and a Heineken lager and a Tiger. But I might be more of a craft beer connoisseur, and so we bring in Affligem and Brand Up from the Netherlands and Mort Subite, which is one of our sour beers from Belgium, to give people the opportunity to express their customization. What we really have going for us is a real breadth of brands from around the world and using that as much as we can to allow consumers to choose the beers that are well-suited for them. Jenna Behrer leads the Innovation Department at Heineken USA, where she oversees all product, packaging and new business model innovation across the brand portfolio. Her team is maniacally focused on finding and driving innovations that address consumer problems in new occasions and consumption moments. She is passionate about bringing the startup mindset to life within Heineken USA, and has championed new ways of thinking and new types of processes to execute a test-and-learn culture. 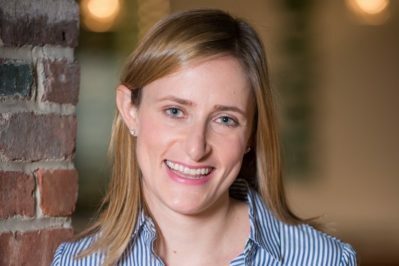 Jenna first joined Heineken USA in November 2016 after 7 years with PepsiCo International, leading in brand management and innovation roles across Chicago, New York and Western Europe, with a key highlight including development and execution of the first pan-Western Europe Quaker Innovation strategy. A graduate of the University of Michigan, she now lives in NYC with her husband Jason and loves international travel and experiencing new cultures.